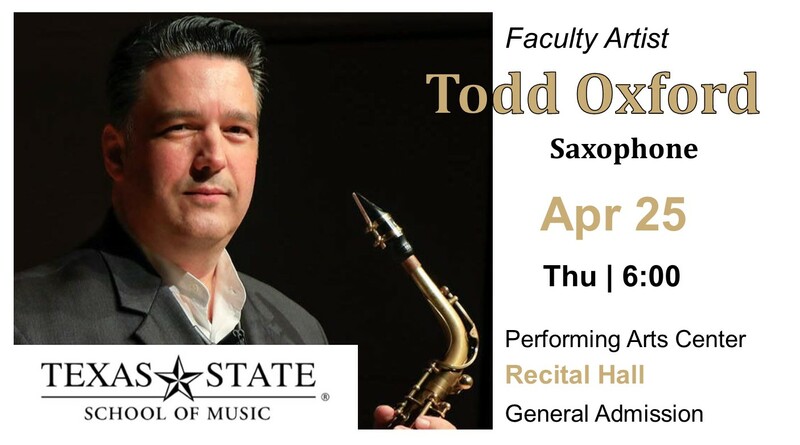 Todd Oxford is a world-class touring performer, recording artist, and educator appearing in Europe, Asia, Mexico, Canada, and throughout forty-six of the fifty United States in venues such as New York’s Carnegie Hall, Weill Recital Hall, Merkin Hall, and CAMI Hall, Dallas’s Meyerson Center, and the Texas Ranger’s Ballpark to perform the National Anthem for a crowd of 30,000. Most recent engagements include two consecutive New York Debuts, the first as a soloist and the second with the ELISION Saxophone Quartet, European appearances at the 14th World Saxophone Congress and a tour of Germany. Asian appearances include two tours of the People’s Republic of China, a tour of Thailand, and a tour of Indonesia. Mr. Oxford’s professional awards include a Grammy Nomination, seven Global Music Awards, two New York Debut Awards, feature in Billboard Magazine, American Prize Finalist, Texas State Artist Nominee, San Antonio Express News’s Best of 2006 Classical Music, Who’s Who in America, Who’s Who in the World, and selection as an Outstanding Young Man of America. He is an Artist/Endorser for Eastman Saxophones. plus $2 processing fee for tickets online or at the window. BOX OFFICE OPENS 30 MINUTES BEFORE THE SHOW. SEATING BEGINS BY 15 MINUTES PRIOR TO THE SHOW. THIS IS A GOLD EVENT. Special Event Parking for all fine arts events occurring in Theatre Center and Performing Arts Center is now only available in the Edward Gary Street Garage, located on the corner of University Drive and Edward Gary Street. With so many things happening this year, don't miss out!